The biggest advantage to having a winter wedding is not having to fight tooth and nail with other brides trying to book the same venues and vendors. Off-season rates are drastically lower, allowing you to allocate your budget for more important things. Instead of viewing snow as a deterrent, use the snowy landscape as background for striking, cinematic photo opportunities. Choosing a winter location such as Colorado or the Alps are ideal for friends and family who love to ski or partake in other winter activities. In general, people like to stay indoors when it’s cold outside. Motivating them to join in on your wedding celebration might take a bit of convincing. Especially if it falls near the holidays, when they might not be able to take extra time off work. A majority of wedding dresses are strapless or sleeveless, but that's not very practical for a bride wanting to take outdoor photos or spend any part of the day outside. 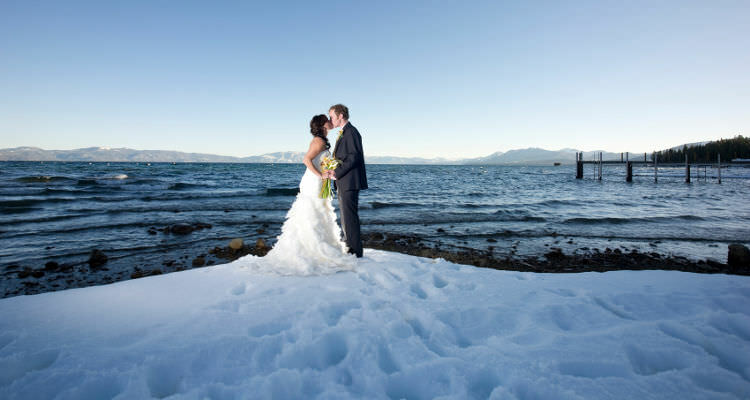 Inclement weather is your greatest opponent when having a winter wedding. All your planning could be for nothing if a blizzard is on its way. Keeping your guests warm and happy is one of your main priorities. A nice touch is to make welcome bags containing blankets, heat lamps, and hand warmers, ready for them upon their arrival. If you choose to have an outdoor ceremony, keep it short and simple to avoid unhappy guests. Serve hot drinks like apple cider, mulled wine, and coffee cocktails during the festivities to keep fingers from freezing. Check to see if your venue has ample heat during the winter. Old churches, especially, can be quite drafty. Gift your bridesmaids with shawls, wraps, scarves, or other winter accessories to keep them warm, dry, and stylish. Adorn your wedding dress with faux fur, capes, or dramatic coats to wear before and after the ceremony. Use your frosty environment to your advantage instead of struggling against it. Incorporate fun winter activities into your schedule that everyone can enjoy, such as sledding, bonfires, and dips in the hot tub!